Buy best-value HULFT Integrate licences for data integration across all business sources. Boost your ROI with partner advice, fast implementation, and optional services. We sell cost-effective licences for HULFT Integrate, as well as HULFT Transfer and HULFT Director. Trust in the impartial expertise of UK HULFT Partners. HULFT Integrate is the trusted platform for automating, orchestrating, and transforming your data integration. What once took hours of coding is now possible with drag-and-drop icons. HULFT Integrate provides a powerful, comprehensive, high-speed data integration architecture. Allow your users to work with all major data destinations through a single visual interface. Our licensing team provides the most suitable licences at the most reasonable prices. As an independent software vendor and service provider, Influential Software stakes its reputation on the quality and competitiveness of its licence offers. 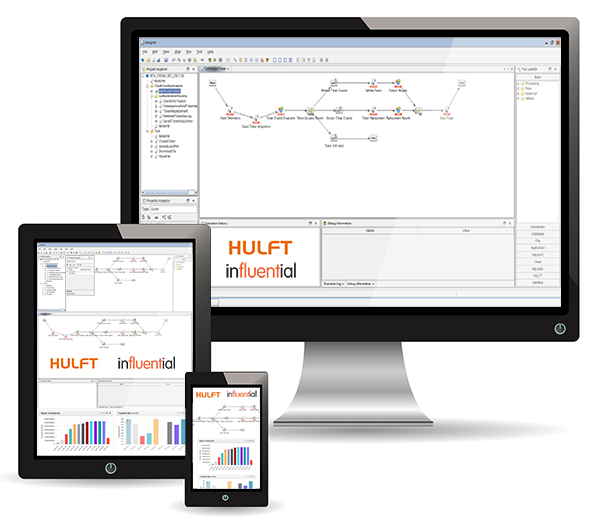 HULFT Integrate comes with a wide range of adapters to connect all kinds of data sources. HULFT comprises three data logistics solutions – Integrate, Transfer, and Director – that find, secure, organise, transform, and move the business data that matters most. Our HULFT UK Partner status is proof of our hands-on knowledge of HULFT in real business situations. For more about our services for HULFT Integrate, why not visit our dedicated site?